On the shores of the giant Kootenay Lake, Nelson is one of the most beautiful towns in British Columbia, in one of the most beautiful settings. Life in Nelson is unhurried, and people still smile and greet visitors. Nelson is known as the “Jewel of the Kootenays”, made famous from the Steve Martin movie, filmed in Nelson, “Roxanne”. Historical buildings, friendly towns folk, and arts, arts, arts! Over 350 lovingly restored turn-of-the-century heritage buildings and facades, breathtaking views and personable citizens make this city a little oasis of genuine civility. Incorporated in 1897 as a mining town, Nelson has bloomed into a unique community with a thriving tourist trade. Cafes and galleries are everywhere, and many residents seem to be artists or crafts people. Most who pass through Nelson want to come back, many of them permanently. Population: 9,923 plus surrounding rural neighbourhoods. 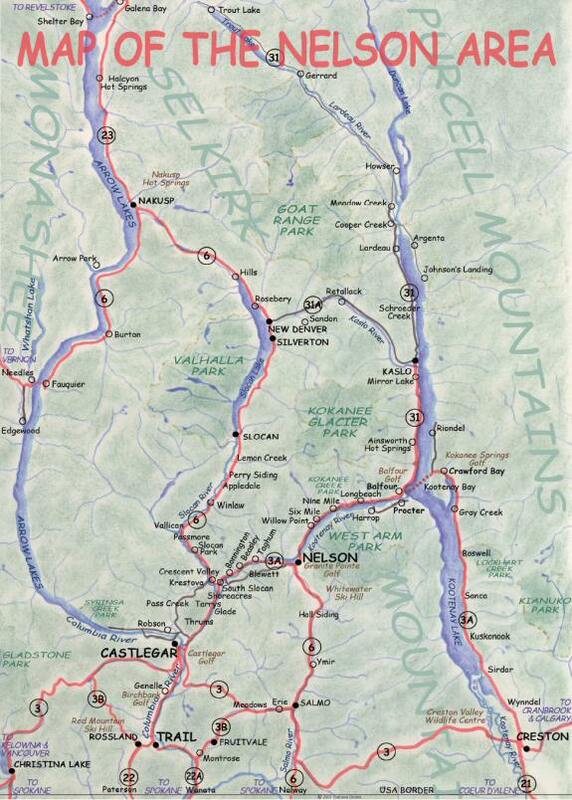 Location: Nelson is located at the junction of Highway 6 and Highway 3A, at the western tip of the West Arm of Kootenay Lake, 26 miles (41 km) northeast of Castlegar.